The Urbane Farmer: Solar panels commissioned, we're making electrons! Solar panels commissioned, we're making electrons! 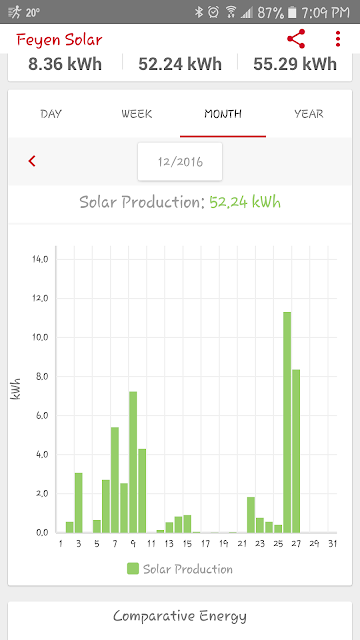 Update on our photovoltaic (PV) system. We are now creating electricity. With shortened days and snowfalls covering the panes for a few days until the snow blows or slides off, we're not creating nearly the maximum output, but it's still exciting to think that some of the energy we use each day comes from our panels. Below is a snapshot from the app (yes, it's got an app!) that shows December so far. 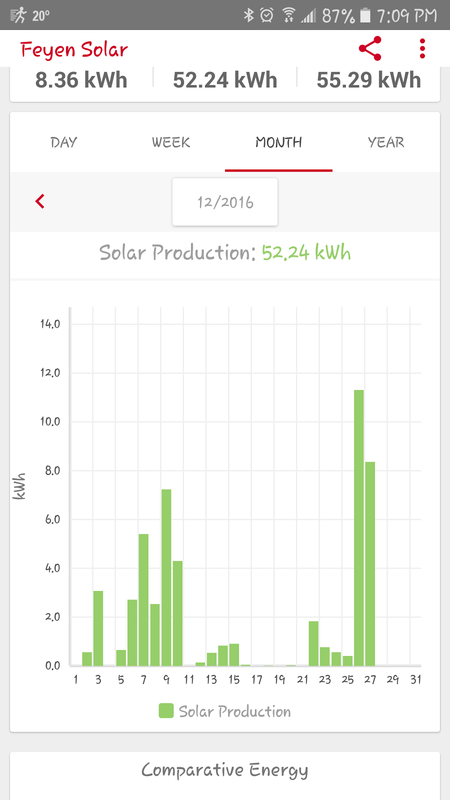 You can see the days when there was snow on the panels (17-21) and when it's been cloudy (most of early December). As the days lengthen and sun gets higher in the sky, we'll get closer to our peak production capacity of six kilowatts and the production will average out. In case you're wondering how all this works, so was I. I looked this up from eco2solar. Solar PV systems use cells to convert sunlight into electricity. The PV cell consists of one or two layers of a semi conducting material, usually silicon. When light shines on the cell it creates an electric field across the layers causing electricity to flow. The greater the intensity of the light, the greater the flow of electricity. PV cells are referred to in terms of the amount of energy they generate in full sunlight; know as kilowatt peak or kWp. I wrote a series about the solar system, if you'd like to read all the parts of this series, you can see them here. 85.61 pounds of CO2 saved from entering the atmosphere.